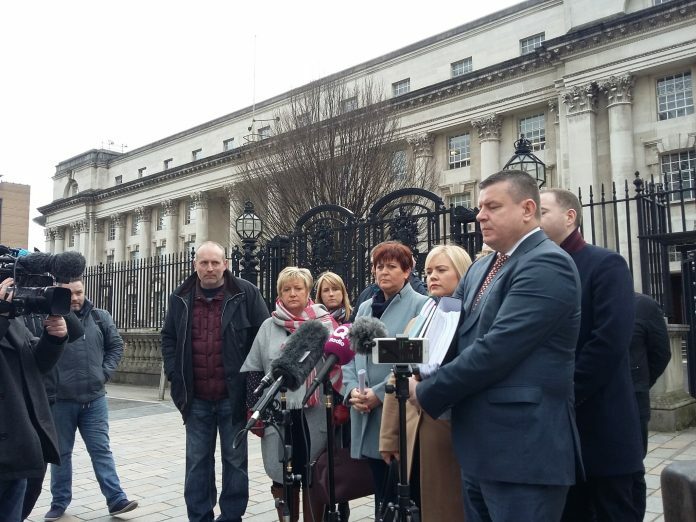 Police Ombudsman and Loughinisland families ask Mr Justice Bernard McCloskey to recuse himself from the judicial review by former head of RUC Special Branch, Raymond White. Another Friday; another day in court for the Loughinisland families; another packed courtroom with the media benches full and public benches crowded. After last week’s drama, Mr Justice Bernard McCloskey had intended to complete the matter of Hawthorne v. the Police Ombudsman, likely quashing the Ombudsman’s report into the police handling of the circumstances surrounding the attack on the Heights Bar in Loughinisland on 18th June 1994. After his coruscating ruling last December, the judge was hardly likely to permit the report to stand. In came the judge and seemed about to proceed without mention of the written applications from the Police Ombudsman and the families last week. He did mention the substantive further written material lodged with the court but was of the view that nothing contained in those need deter him from moving swiftly on. Barra McGrory got to his feet and asked to address the court on behalf of the Police Ombudsman; the judge was brusque and asked whether people had not understood his ruling from last week that without anything substantive, the court would make a final ruling. Barra McGrory indicated that he may have misunderstood, for he had prepared oral submissions. These the judge did not wish to hear. Fiona Docherty on behalf of the families was also asked whether she had misunderstood; “we can examine the transcript from last week and see exactly what was the order of the court”. Further: “I’ve read the written applications exhaustively and I don’t need to hear oral submissions.” And like last week he made remarks about proper court practice and fair process: “Having been in practice and on the bench for 39 years ”matters are routinely decided on the basis of written applications”. Nevertheless, Ms Docherty persisted asking whether “the court would give me five minutes” to make some brief remarks. At which point, having plainly failed in his initial plan to blithely ignore a substantive matter, Bernard McCloskey conceded. The oral submissions would be heard in open court and a hearing of nearly two hours (including a brief adjournment) considered the matter of whether the judge should step aside from the case because he was plainly biased – whether consciously or no – in favour of the applicants, two former RUC officers, one of whom Mr McCloskey (while still a barrister) represented in a previous judicial review against the Police Ombudsman. in both cases the applicants argue that the Ombudsman was procedurally unfair in coming to the critical conclusions against the police. In the context of this conflicted society where policing is a controversial matter and of great sensitivity, justice must be done and be seen to be done. On the other hand, Mr McMillan argued that is long established that barristers have a solemn obligation to represent their clients no matter the case and their political or community background. He pointed out that the supposed relevance of the previous case and Mr McCloskey’s connection to it was known to the Police Ombudsman’s legal team certainly by 13th December. There appeared no difficulty at that time. The only two matters to have changed since then were the ruling on 21st December and the appearance of the Irish Times article suggesting a conflict of interest. It follows that this application to the judge to recuse himself could simply be an unwillingness to accept the ruling of the court; this is not a sufficient reason for such a recusal. It follows that Mr McMillan was of the view that the application by the Police Ombudsman and the Loughinisland families is “absolutely without merit”. In a remarkable closing sequence, the judge informed the court that he would consider matters over the next week and make his ruling on this matter next Thursday 25th January. If he recuses himself, the whole case will have to be reheard; if he does not, he will proceed immediately to final judgment. He then brought to the parties’ attention two judgments where he had been very critical of police disclosure in a prosecution case. The purpose of these points of information was not entirely clear. Perhaps we will find out next week.